Staying fit and healthy has never been easier with a Garmin fitness tracker. Designed to help you to improve your everyday habits and monitor your fitness, a Garmin fitness tracker not only remind you to stay active, but it also lets you to track your progress too. Changing the way you move everyday, all Garmin fitness trackers come complete with an innovative Move IQ motion detector that tracks your steps, the amount of calories burned, intensity duration and time of day. So whether you’re swimming, walking, running, cross training or biking, your Garmin fitness tracker will monitor your every move. 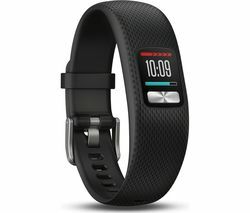 With a one year battery life, a Garmin fitness tracker can also be worn everyday and can even be used to set personal daily goals that can then be adjusted with each milestone that you hit. Of course, this will also allow you to track your progress. But that’s not all… these smart fitness trackers will also allow you to enjoy a whole host of other smart features including a move bar with double alert, which will remind you to move every hour. All you will need to do is walk for a few minutes to reset it. A Garmin fitness tracker can also be used to monitor your sleep quality. 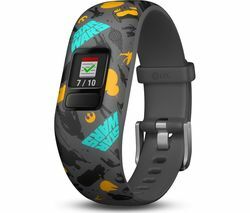 Available in lots of different designs, patterns and models, you will be able to browse a great choice of Garmin fitness trackers within this category including the Garmin vivofit jr 2 Kid's Activity Tracker - Minnie Mouse, Adjustable Band, the Garmin Vivosmart 3 HR and the Garmin vivosmart 3. Perfect for the whole family, after a week wearing your new fitness tracker you really will wonder what you did without a Garmin fitness tracker in your life. And if you cant find a Garmin fitness tracker that meets your requirements, don’t worry. We also offer a great range of Fitbit fitness trackers.